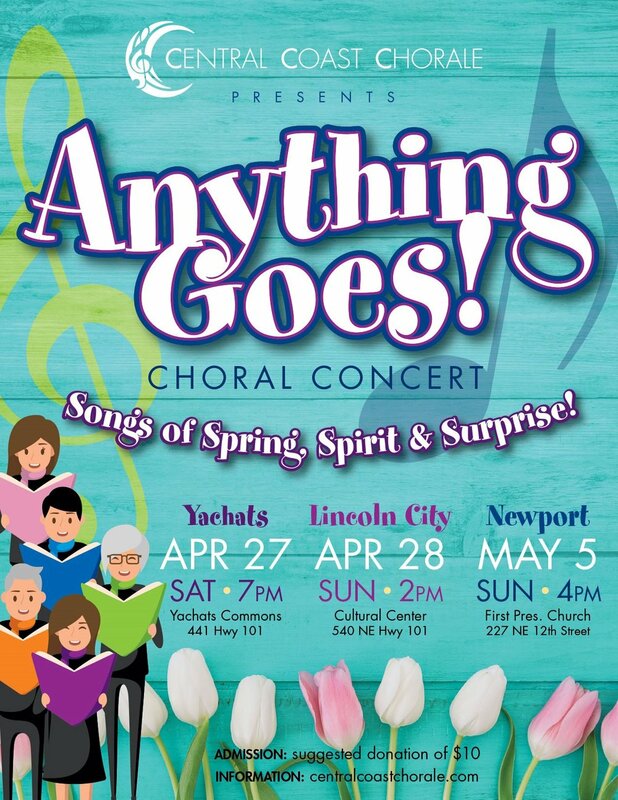 The Central Coast Chorale will be presenting their annual spring concert series, Anything Goes, in late April and early May. They will begin in Yachats with an evening concert at 7 pm on Saturday, April 27 at the Commons. The concert will be repeated in Lincoln City the following afternoon, 2 pm on Sunday, April 28 at the Lincoln City Cultural Center. Finally, they will wrap up their 2018-2019 season with a final concert in Newport at 4 pm, Sunday May 5 at the First Presbyterian Church. There is a suggested donation of $10 per person for admission or $20 per family. It is the choir’s tradition to make their spring concerts an ‘anything goes’ affair, hence the name of the concert. When choir director, Dr. Mary Lee Scoville, is asked what “Anything Goes” means she replies, “It means we get to sing anything we want!” This season the choir has chosen to sing a beautiful and technically challenging piece from the classical repertoire, Vaughn Williams’ The Spring Time of the Year. The composer adapted this song from an old English folk tune, a lovely if rather sad tale of a sailor and his lady love. They have also chosen two songs by American composer Aaron Copland. The rhythmically complicated lullaby The Little Horses, a part of Copland’s Old American Songs series, can be tricky to sing but is fun to hear. And the lovely, sweet, old Shaker song, Simple Gifts, adapted by Copland first for his ballet Appalachian Spring and then for the American song collection, will be familiar to most listeners. Turning to some more upbeat tempos, the Chorale will journey to the Caribbean for a rendition of Harry Belafonte’s Turn the World Around, perhaps most famous for its performance with the Muppets on PBS. And then they’ll move on to Africa for Kuimba! a folk song adapted by Texas composer and educator Victor Johnson. The choir will add some drums to this song that encourages people to sing of love and peace with a joyful heart. There’s also a lot of fun on the program for this spring show. In addition to Animal Crackers, three pieces by Eric Whitacre that adapt the rather silly poems of Ogden Nash for choral voices, the Central Coast Chorale will also be singing a piece by comedy composer P.D.Q. Bach, known in real life as Peter Schikele. Schikele likes to take real classical pieces and make them funny. The choir will be singing My Bonnie Lass She Smelleth, a parody of Thomas Morley’s My Bonnie Lass She Smileth. It’s a subtle difference until you really listen to the lyrics and catch the musical jokes inserted in the score. The Women of Note octet will, as always, be the choir’s special guests at the Anything Goes concerts. This year they will be singing choral adaptations of two poems, There Will Come Soft Rains by Sara Teasdale and Down by the Salley Gardens from Irish poet William Butler Yeats. Both are set to hauntingly lovely tunes, the first by Kevin Medley features an oboe accompaniment and the second, arranged by Michael Cleveland here, has become one of the most recorded Irish songs of all time. With such a variety, the Chorale is sure that everyone will find something to love on this program. Please join us at one, two or all three of these concerts!